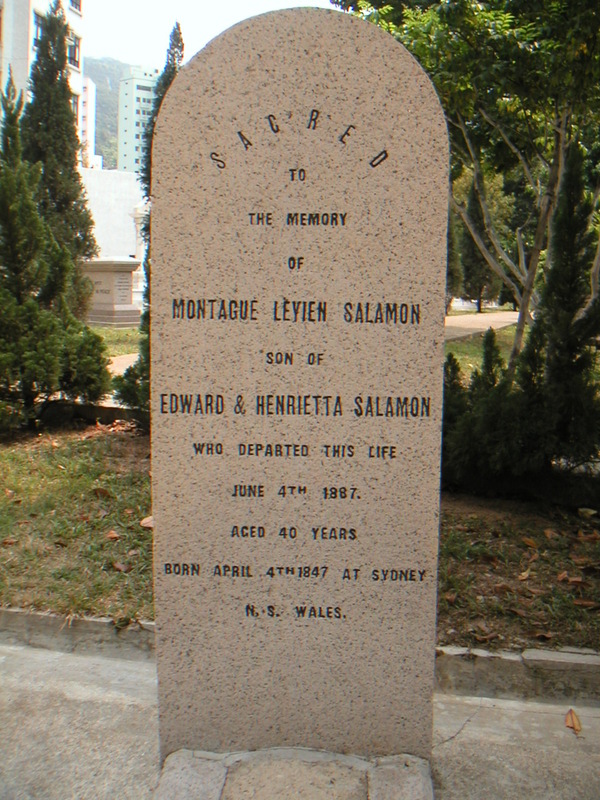 Inscription (Eng) SACRED TO THE MEMORY OF MONTAGUE LEVIEN SALAMON SON OF EDWARD & HENRIETTA SALAMON WHO DEPARTED THIS LIFE JUNE 4TH 1887. AGED 40 YEARS BORN APRIL 4TH 1847 AT SYDNEY N. S. WALES. Historical In the 1884 jurors’ list, his name appears as “Montague La Vigue Salamon”. He was a shipbroker in partnership with George Holmes. The firm was known as Holmes & Salamon. The Salamons had seven children: Harriett Ann (b. July 21, 1842; d. 1925); Francis Edward (b. March 19, 1845; d. September 25, 1850); Montague Levien (b. 1847); Florence Matilda (b. March 28, 1849; d. October 29, 1850), Maude Philippa (b. January 17, 1852; d. July 18, 1909), Isabella Annette (December 8, 1854; October 3, 1933) and John Benson (b. December 13, 1856; March 21, 1859). Florence died on George Street (presumably in Sydney) of a “severe illness”, age 19 months. John died at home on Victoria Terrace in Wooloomooloo, age 2 years and 3 months. According to a cousin of a cousin, Babs O’Connor, Maude seems to be the only child who married and had children. She married the Hon. Henry de Bohun Devereux on July 17, 1872, at St. Mark’s Church, Darling Point, NSW, Australia. They had 10 children together.